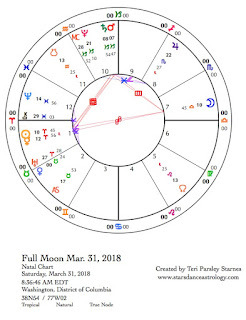 March 31—Full Moon: Blossoming. Spring is here in the northern lands, even if the ground is frozen, like it is where I live. The unpredictable Aries energy of this season, flavored mightily by Mercury retrograde, encourages emergence and foolishness. This Libra Full Moon illuminates the vulnerability of this season in the ways we wear our hearts on our sleeves and care so deeply about the world. Within the Aries archetype of courage and daring lies a soul that feels unsure and tender. Contrast this feeling with the earthy vibes emanating from Venus and Mars. Venus in Taurus and Mars in Capricorn influence the season and this Full Moon through bringing attention to physical reality. Our bodies are taking a journey through this foolish season. What is your body telling you? How often do you listen to the messages? In this season, there is risk of failure, yet within us is wisdom and the capacity to embrace even more fully this human life. How do we care for ourselves more? This lunar cycle began in the generative waters of Pisces. This dreamy influence contributes to a feeling that we aren’t fully online with the forward momentum of spring yet. We still feel mutable, shifting into the new place, but not yet fully arrived. The retrograde motion of Mercury in Aries during this cycle contributes a sense that backwards is forward. We are rehashing things. We are noticing and absorbing in a non-linear way crucial information that will help us engage more fully with life later. An important stage of the Mercury journey happens the day after this Full Moon when Mercury conjoins the Sun at the heart of the retrograde. This tricky Mercury has other business too. On April 4 and 5, Mercury will make a square to Mars and Saturn in Capricorn. This influence accounts for the earnest desire to be accountable and successful in our interactions with others. We are noticing that we can’t take connection with others for granted. Communication requires effort. Mishaps could create judgments. Mercury reminds us that we can’t control the outcome of every effort to connect. Sometimes we have to let go of expectation too. Mercury retrogrades are great opportunities to look at our assumptions and reactions when those assumptions don’t pan out. Tomorrow is April Fool’s Day. What could be a better way to celebrate our foibles through this season than to remember we are flawed and brilliant both. Thank you, Mercury. Venus plays a big role in this Full Moon illumination. Venus, the guide to beauty and pleasure, just entered Taurus for the next three weeks. Venus rules both this sign and the sign of the Moon, Libra. Venus in Taurus is earthy, fertile, and sensuous. Venus invites us to slow down and listen to our bodies. Perhaps we’ve forgotten the importance of pleasure. Perhaps we can savor our experiences a little more under this influence. Venus in Libra is airy, gracious and collaborative, acutely attuned to imbalance and injustice. The Libran influence of this Full Moon reminds us that relationship is an essential part of re-emergence too. We are not islands without connection or responsibility to each other. The give and take of relating shapes who we can become. I’ve already mentioned Mars and Saturn in Capricorn, but these two planets effect this lunation just as strongly as any other influence right now. On April 2, Mars and Saturn conjoin as Saturn begins to station. (Saturn turns retrograde on April 17). Saturn in Capricorn is about accountability. It is about recognizing that lasting success will only come from determined action. Saturn is the devil that can imprison us in shame and despair. Saturn is the ruler of melancholy. And though it is our best hope for attaining mastery, Saturn can feel harsh and depressing. Mars, as energy and will, could be feeling depressed right now. The rest of this lunar cycle, could be a good time to recoup and rest. Perhaps you’ve expended all the energy you can at this time. Earth tells us to slow down. It reminds us what is really precious and what isn’t. This isn’t the time to judge ourselves harshly about our imperfections. The lessons and gifts of this lunar cycle reside in accepting just how much we care and how little we can do alone. Be good to yourself. Sunday, April 1. The heart of this Mercury retrograde period also happens to occur on April Fool’s Day. I love these cosmic jokes. This one is an opportunity to put inflated self-importance into perspective. But avoid being cruel to yourself. We are all flawed. We all have to make u-turns from time to time. Mercury in Aries asks us to investigate identity. Who we are is more mutable than we think. Can it be OK to inhabit this place of uncertainty? What is liberated when we release old forms of identity? What new purpose is revealed when you see yourself in a new way? The Fool is a sacred character playing a sacred role. It is common to be annoyed with how Mercury retrograde disrupts business as usual. On this foolish day, perhaps you will be visited by the Holy Fool bringing you a fresh perspective. Look for it. Monday, April 2. A seed moment is created when planets come together. Such a moment occurs today with the conjoining of Mars and Saturn in Capricorn. Seed moments are great times to set a new intention. Planting an intention involves acknowledging our hearts’ desires and releasing them into the darkness to grow. This kind of intention work involves engaging with our wills to manifest and surrendering control over what will ultimately happen to our newly planted dreams. These stages of manifestation reflect the energy of this conjunction. Mars is will. Saturn is commitment and surrender both. Saturn teaches us to back up our desires with committed action, but Saturn can also be the voice of the critic, never satisfied that the effort is good enough. What we surrender is crippling shame. To make a difference, we show up and do our best. This best need not look like anyone else’s best. It isn’t easy to stay true to that version of best. The conjoining of Mars and Saturn isn’t easy. Self-judgment is the biggest impediment to reclaiming our wills and desires. Is there work for you here? Plant a seed. Commit to the desire. And give it over to the magic of the soil. Tuesday, April 3. We might feel a little down, a little low energy today under the influence of the Mars/Saturn conjunction in Capricorn. The Moon in Scorpio has us diving under and within emotional complexity. It could feel like the best choice is to stay close to home and tend to nagging self-doubts. A conjunction between the Moon and Jupiter today could lighten the mood or expand the soul searching we are prone to do today. Messages about not being good enough could feel overwhelming right now. Solitude can be a solace but isolation can exacerbate self-criticism. Go easy on yourself, and if you happen to be feeling more resilient, then give attention to others who could be suffering alone. April 4—Disseminating Moon: Fruiting. Contrasting influences invite us to notice our attachments to progress. The idea that we must always improve, learn a lesson, or evolve towards some perfection keeps us isolated. We aren’t available for connection to others, including the natural world, if we are always reaching for something not present or judging parts of ourselves as not good enough. Aries influence provides the impulse to act. The Capricorn influence (provided by Mars and Saturn conjunction) says wait a minute, do you really know what you want? Do you really have what it takes to make it happen? Mercury, moving retrograde through Aries is forming a square to Mars today and Saturn tomorrow. Mercury’s gift as it moves retrograde is the opportunity to reflect and reframe something we thought to be true. Perhaps you are reframing the notion of what it means to act or to succeed. Perhaps you are longing for connection and are willing to let go of the idea of progress. Thisi s a big reframe. What are we left with if we aren’t attached to improvement? This is a marvelous thing to investigate during this phase of the Moon when we are beginning to harvest the fruit from our experiences. The Moon in Sagittarius allows us to follow our thoughts freely. New philosophies could be born. Possibilities could open before us. What will you discover? Thursday, April 5. How seriously are you taking yourself right now? Mercury in Aries forms a retrograde square to Saturn in Capricorn today, inviting us to lighten up. If not, the typical Mercury retrograde mishaps could drive us over the edge. The Moon in Sagittarius encourages foolhardiness by tempting us with adventure and exploration. We don’t have to make the adventure big, just walk through the day wondering what there is to discover. Who there is to connect with. How we can release some of the burdens of expectation. Will you play? Friday, April 6. What have we learned about self-judgement, failure, despondency? If you’ve been paying attention, you know these qualities may keep us from experiencing the joy and potential of being present to our lives. As the Moon moves into Capricorn, we have the opportunity to see another side to this influence. Ask yourself, why do I care so much? Why do I give myself such a hard time? Why are my expectations so high? Capricorn (and Saturn, its ruler) is deeply committed to excellence, integrity, and the preservation of beloved community. What feels that important to you? Saturday, April 7. We’ve got an opportunity to reset the pattern. Perhaps this last week felt a little gloomy (thanks Mars and Saturn in Capricorn), or didn’t work out the way you wanted them to (thanks Mercury retrograde). Well today, Venus in Taurus says be good to yourself. Maybe it is OK to pamper yourself a little. This Venus makes a harmonious trine to Saturn. There is a way to align a sense of purpose with a sense of pleasure. The Moon in Capricorn conjoins Saturn and Mars and reinforces the trine to Venus. Acknowledge all the ways you continue to show up—for your work, for yourself, for the world. And give yourself a reward of embodies presence and pleasure. 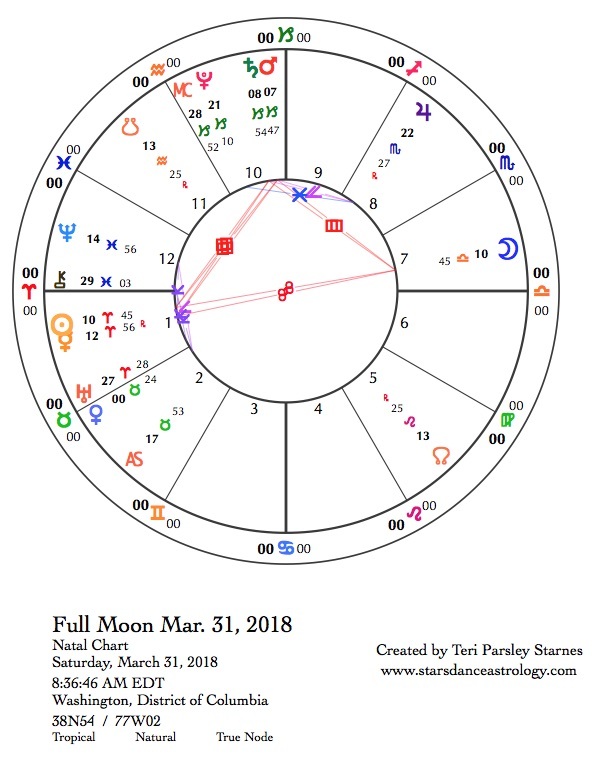 About these forecasts: Through following the Moon, the planets, and the wisdom of the seasons and signs, my goal is to offer a useful practice of mindfulness and intention for the thoughtful seeker. Read about the beginning of this lunar cycle here.